Rebecca and Colin came from the East Coast of Florida and chose the beautiful Powel Crosley Estate www.powelcrosleyestate.com as the Venue for their wedding ceremony in mid-January. Rebecca looked amazing as she was escorted down the aisle by her father to join Colin at the foot of the stairs on the Loggia. There, in front of their family and friends, the couple shared their vows, exchanged rings and were pronounced husband and wife by Rev. Rick Lackore of Sensational Ceremonies www.sensationalceremonies.com . 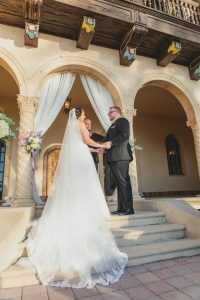 Ceremony Music and Sound provided by Eric with Grant Hemond and Associates http://granthemond.com and Venue and Ceremony Coordination provided by Anastasia with the Sarasota Wedding Gallery https://sarasotaweddinggallery.com . Congratulations to the new Mr. and Mrs. Colin Kleinkopf!